From fascinating history to superb shopping, a tour around Old Goa and Panjim will make you glad you took time off from the sun, sand and sea. Goa isn’t all about the beaches; the state boasts immense history, best discovered in Old Goa and Panjim. The former was once referred to as the ‘Rome of the East’ such was its significance and grandeur during the colonial era, while today Panjim, the state capital, is another destination of heritage and culture. 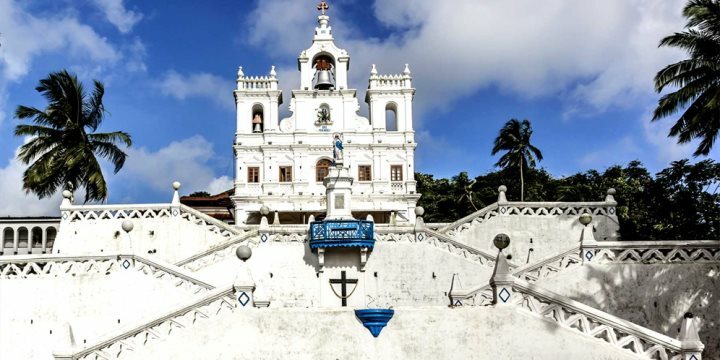 Your exploration around Old Goa will see you visiting the Basilica of Bom Jesus where the secret relics of the missionary St. Francis Xavier are kept intact. Se Cathedral church is also on your itinerary, and is recognised as one of the largest churches in Asia, while the famous and iconic Golden Bell, set within the church, is well worth a place on your camera. Your next stop is just a short drive away, but before stopping in Panjim, you’ll get the opportunity to explore and shop at Exotic Jems, where you can get your hands on some sparkling souvenirs to take home with you from your Goa holiday. A traditional lunch will fuel you for the afternoon, before embarking on a tuk tuk tour of the Mala and Fontainhas areas of the city. Here you can learn about Panjim’s Latin Quarter and Hindu areas, both boasting beautiful buildings and temples. You will be able to book this excursion on arrival or during your holiday to Goa.